Ulster GAA in conjunction with The Northern Ireland Anti-Bullying Forum (NIABF) and the Child Protection in Sport Unit (CPSU), are calling on all units of the Association to take part in Anti-Bullying Week between 12th – 16th November 2018. This year’s theme for the campaign is “Respect” which looks at how can encourage children and young people to think about what the respect means to them, what it feels like to be respected and how they show respect to others. Overall, we will be exploring how respect for others can build an anti-bullying culture in Gaelic Games and Activities. 4. First response by coaches/mentors when they see unacceptable behaviour happening is vital. • Support the young person, your initial reaction is vital – Listen, Learn, Involve and Resolve. 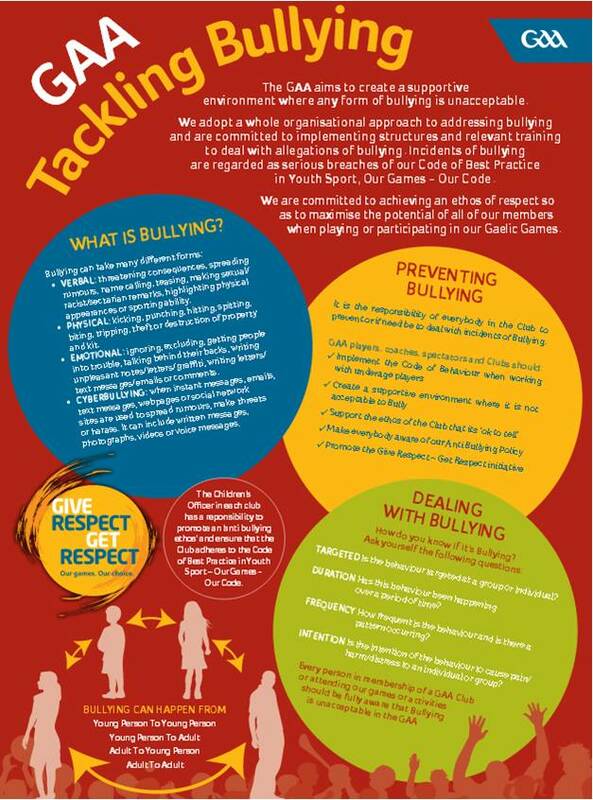 GAA Code of Behaviour – the Code of Best Practice in Youth Sport for the GAA includes the Anti- Bullying Policy, which aims to adopt a whole organisational approach to addressing bullying and provides advice and support to clubs in the area of Safeguarding. We remind all clubs to implement the Code with all relevant personnel in your club including players/coaches/committee members/parents/referees and supporters at the start of each season. It is also appropriate at this time of year to remind you to make sure that all those working with children and young people in your club have been appropriately trained and adequately vetted prior to commencing work in the club.